V2 uploaded 02/18/2019 - It may not show yet. New ZIP is about 1.4MB. Reworked some of the map, improved texture variety, added bot waypoints. added a couple ambient sounds. A space station belonging to an evil corporation is drifting through space on an asteroid. I need feedback (map layout, item placement, lighting, textures) on this map. I started the basis for this map just over 10 years ago and uploaded it here. It was very poor. I found it on my old computer and decided to start working on it again. Any feedback is much appreciated. You might want to use /hidehud 1 (default 0) for a cleaner view. The dimensions usrd on Quadropolis for screenshots is normally 640x480. Resizing a screenshot that uses 1280x960 (or 1600x1200) is the easiest to work with. Time to view the map. When loading it ingame, I was worried of being a very dark map, but was pleasingly surprised to be that more bright than seen on any screenshot. The texturing is consistent. Every piece of geometry is covered by a tech-based texture. I'm not very font of using the lunaran textureset in combination of the techsoc textures, as one set has specular light, parallax-mapping, while the other has just plain nothing. This breaks the feeling of being in space. Although it is actually not a good thing, I like to see the use of the good old aardograss_1/ik_floor_wood128/ik_brick_3216d/ik_floor_brick128a/ik_brick_6464c/ik_ground_cobbles128 combo which used back then as default. Perhaps a guilty pleasure though. The geometry is still basic (the area which you roam around is a box with different levels in it), so that could be spiced up better with changes in the layout. It's nice to hear some sounds troughout the map. That most often is being forgotten. The gameplay itself has been thought about. There are plenty of playerstarts scattered all around the map, same for other pickups. I do have to mention that the clipping is still unfinished. You could easily get over the borders of the map by doing a grenade- or rocketjump (although a riflejump at the jumppad to the highest platform works perfect also). So make sure the areas which shouldn't be accessible are entirely filled with clipping material. Look for examples on existing maps. The included waypoints makes it fun to play all alone also. I see you've added additional files to the zip-file. Could you notify (on the node and in the zip-file itself) where you took the samples from, what programs has been used to tweak them and under which license they are? In overall, the map gives the feeling like some maps used to be back in the days it has been created. It's a nice experience if you remember that time. You've also included some temporary files within the zip-file (DS_Store), please delete them before uploading. I'm with you on the lunar/techsoc combination. It seems to make some areas appear overly dull compared to others, due to the lack of shader-effects on some of them. I agree, the main area seems a little... dull. I just started adding a room/overlook that overhangs the green armor, and has a hallway to access it at the top of the stairs by the helipad. I plan to add a teledest in that room as well, so that someone hiding in there could always be surprised by somebody. I'm also looking into other ways to spice it up a bit. I'm looking at possible adding overhangs, etc to a couple of the "ramps" to give certain areas a more boxed in feel to contrast with the openness of the rest. I've been playing Cube/Cube2 since 2005 so it makes me happy to hear this map as a sort of "old school" feel to it. Not to mention the map was started 10 years ago or so. 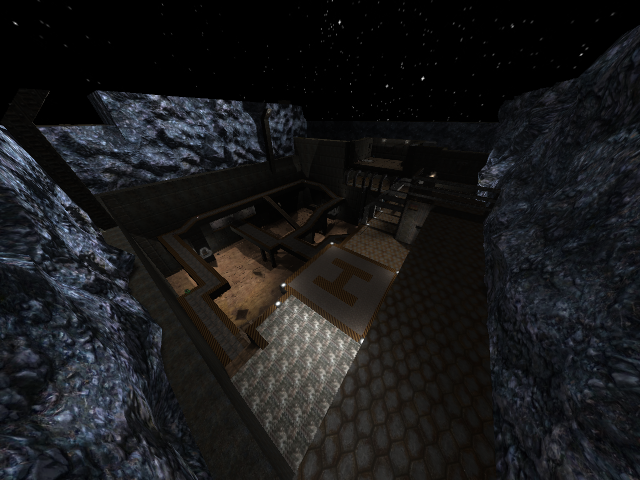 It is inspired a little bit by Complex,Metl4, and the map "Hang Em High" from Halo. Thank you again for taking the time to review this map. It helps a lot.